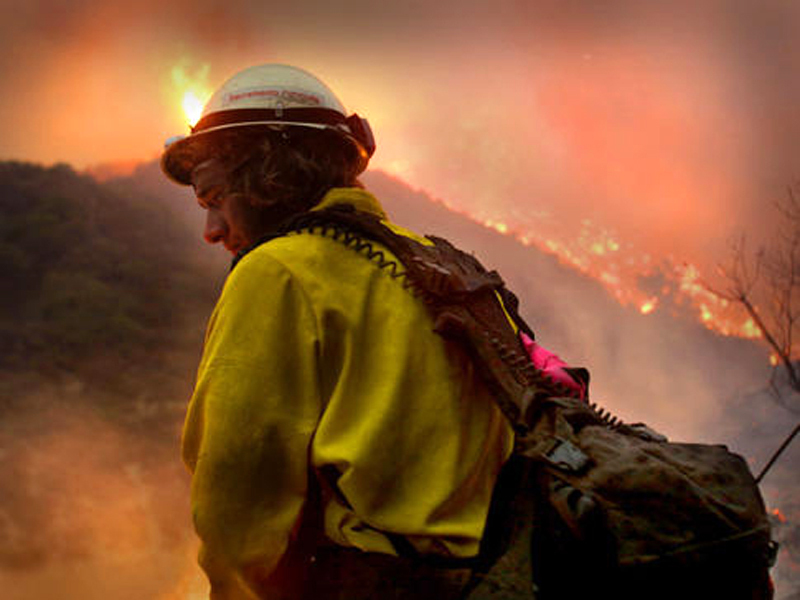 Five years ago, the Station Fire ravaged through hundreds of thousands of acres of the Angeles National Forest, killing two firefighters and destroying more than 100 homes and structures. Several Los Angeles County Fire Department officials including Chief Daryl L. Osby met with Supervisor Michael D. Antonovich on Friday to honor the memory of Fire Captain Ted Hall and Fire Fighter Specialist Arnie Quinones, who lost their lives while fighting the fire. 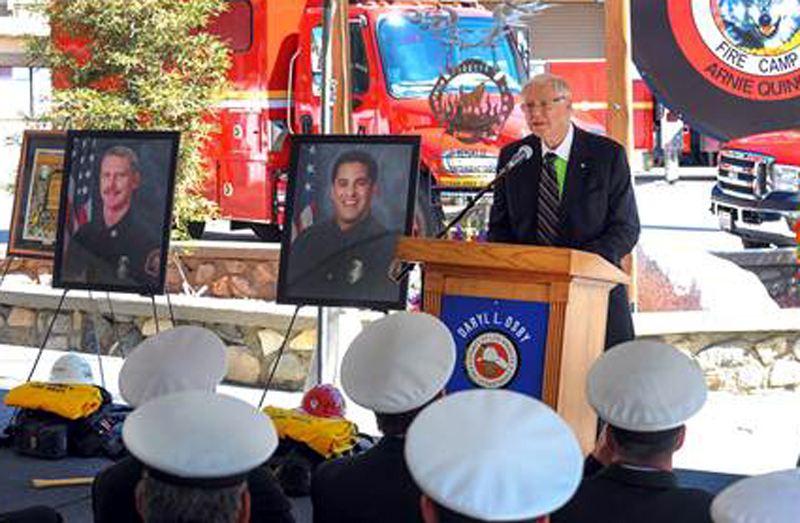 "Ted and Arnie will be remembered as proud, cherished family men, and courageous firefighters who were steadfast in their quest for excellence, hard work and completion of the mission," Antonovich said. 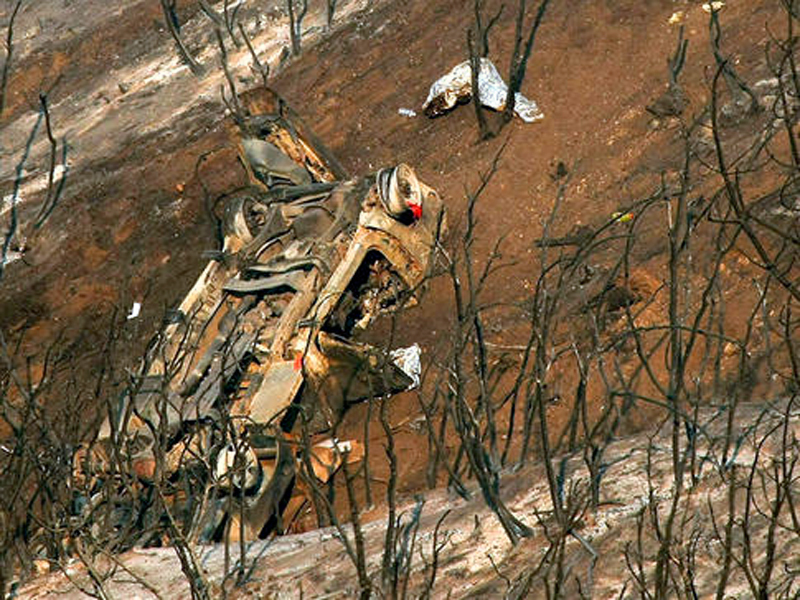 The firefighters were killed about 2:30 p.m. Sunday when their vehicle rolled off a mountainside road in the Angeles National Forest, south of Acton near Mount Gleason, fire officials said, according to an NBC Los Angeles article. Quinones, 35, of Palmdale and Hall, 47, of San Bernardino County were supervising an inmate work crew at a remote prison camp. Officials believe the men may have been searching for an escape route for the three corrections workers, other fire personnel and 55 inmates who were stationed at the camp. They were "apparently taking action to protect the camp facilities and personnel," county Fire Chief Michael Freeman said in a statement, according to an NBC Los Angeles report. Hall had been with county fire for 26 years, while Quinones had been with the department for eight years. "You knew, as we said goodbye to Ted and Arnie each day that it might be for the last time. You knew that they might not come home. You lived everyday with that uncertainty," said Arnold Schwarzenegger, who was governor of California at the time. "You still supported them and the work that they loved so much -- and the work that kept us all safe." The Station Fire began on Aug. 30, 2009 and is known as one of the largest fires in Los Angeles County history, reaching more than 160,000 acres. More than 3,000 fire personnel battled the flames for nearly a month, costing more than $80 million dollars to fight. At the peak of the fire, air operations consisted of 23 helicopters, 8 tankers, 2 DC-10 air tankers, the 747 supertanker and the Martin Mars super scooper. The Los Angeles County Board of Supervisors unanimously approved Los Angeles County Fire Department recommendations to the Forest Service on how to prevent future catastrophes a few months after the Station Fire. The recommendations included nighttime air attacks, procedural changes, tougher brush clearance requirements and the use of mechanized firefighting equipment. Police did question a man seen in the area when the Station Fire erupted. Babatunsin Olukunle was taken into custody following a news conference to announce that he'd been seen in the area of the blaze dubbed the Lady Bug fire, according to an NBC Los Angeles report. It burned only a small patch of scrub but was less than a week before the devastating Station Fire and only six miles away. "We are going to talk to him about the Station fire, but we're not going to list him as a suspect [in that fire] just yet," Lt. Liam Gallagher told the LA Times. Olukunle was eventually charged with one felony count of unlawfully causing a fire in a national forest, officials said. He later pleaded not guilty.